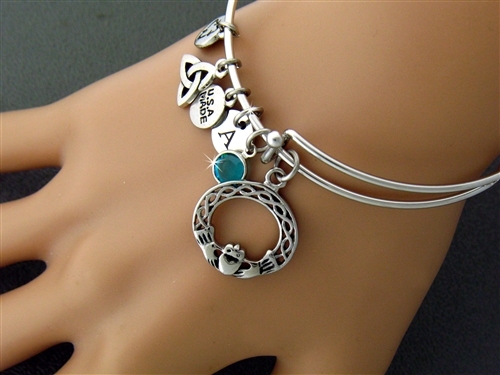 The timeless symbolism of the Irish Claddagh combined with elegant Celtic open weave love knotwork gives our 316 L Stainless Steel Claddagh and Celtic Knotwork Circle adjustable bangle a fresh spin on the popular "O" jewelry! Like a woven silver bridge, the knotwork arches over the Claddagh to form an unending loop of Celtic design. Bangles are available in 3 sizes small, med and large. X-Lg. – 2 5/8" Fits 8"-9"
If you want a birthstone(s) or initial(s) added please let me know in your notes and we will contact you with pricing options.